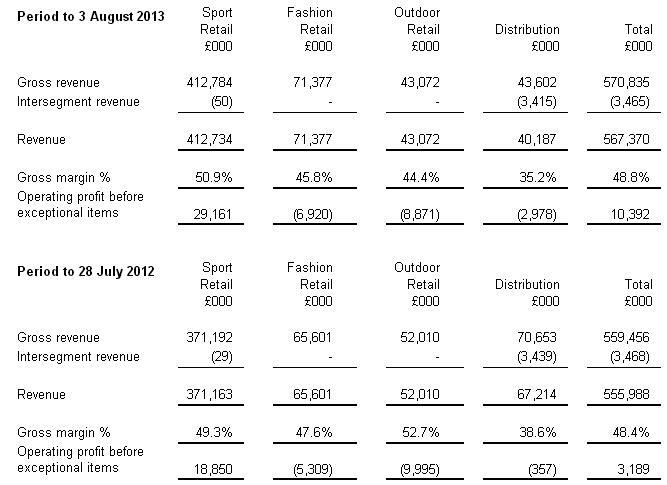 I’ve held JD Sports for quite a while, and a few days ago its latest interim results were released. The core business is doing extremely well. JD Sports stores are currently the leaders in sports fashion wear, with pretty much no competition. Stores like Sports Direct and Decathlon focus on people that actually play sports and require the gear for it. JD Sports is all about looking good. But while the JD business is thriving I am not at all pleased with how the overall group is doing. The group is made up of not just JD Sports but Fashion stores like Bank, and now Blacks which is a higher end outdoor retailer. The fashion and outdoor segments are rubbish in my opinion. They have no unique selling point, they are in fierce competition with all sorts of competitors and unlike JD Sports shops, they do not offer something unique to the customer. Just take a look at the segment breakdown from the half yearly results. JD made £29m in operating profits in the first half, which was reduced to just £10m after the losses of the other segments. What’s more is we’re seeing no improvement in the operating losses of fashion and outdoor. Now I’ll admit these segments are seasonal and we had a bit of a late summer this year, but JD is managing record profits while fashion is failing miserably. Fashion makes a small profit each year and has only a small amount of net assets on the balance sheet so there is not much to gain by shutting the whole thing down. They have announced a new director of the segment to try and improve returns. Substantially complete? It’s still losing money hand over fist, which management puts down to not having the right product mix as they decided at the last minute to keep the Millets branded stores open. I’ll give them a little while longer to see if results improve in the second half, after all JD has some of the best managers in the retail industry and they have a better chance than anyone to turn it around. But some businesses are doomed to failure. I think the JD retail business is worth 14x earnings, it has a strong position in sports retail and has shown incredible like for like sales growth in one of the worst retail environments in recent history, partly due to JJB and other competition going bankrupt. The rest of the business I honestly think is worthless, as it has no net assets and makes no money overall. Given it has £46m in net cash I think it is worth £732m compared to the current market cap of £496m. I don’t mind holding this long term though as it’s a well run business and intrinsic value keep increasing. Posted in: Stocks Filed under: buy, JD Sports, JD.